I borrowed these books from our local library thinking they would be a good set of readers for my 8 year old. Given the title of “My first stories,” I thought the vocabulary would be quite simple. While there were a few titles that she could read (Like Le Meilleur endroit and Le Pire Moment by Andrée Poulin), most of the titles were too complex, so I switched them to read-alouds instead. Reading them aloud worked for a few of the books, but they quickly became too complex even for that. We ended up returning most of them unread. 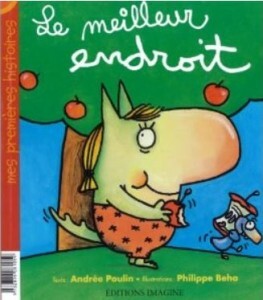 The stories would be fun and engaging for a young francophone child who already had the vocabulary, but for children trying to learn the language in the early stages, they just weren’t a good fit. That being said, if your child has been in French immersion at school for several years, and you speak French quite well yourself, this series may be an ideal one to read together. Personally, I found the stories quite interesting – it was my kids who tuned out because they couldn’t understand what was going on! This entry was posted in 0-3 years, 4-6 years, 7-10 years, Advanced, Bilingual parent, Books, Immersion by Leanne. Bookmark the permalink.